There is a lot to do on Donner Summit. One thing to do is take advantage of the rich history by seeing it in person. 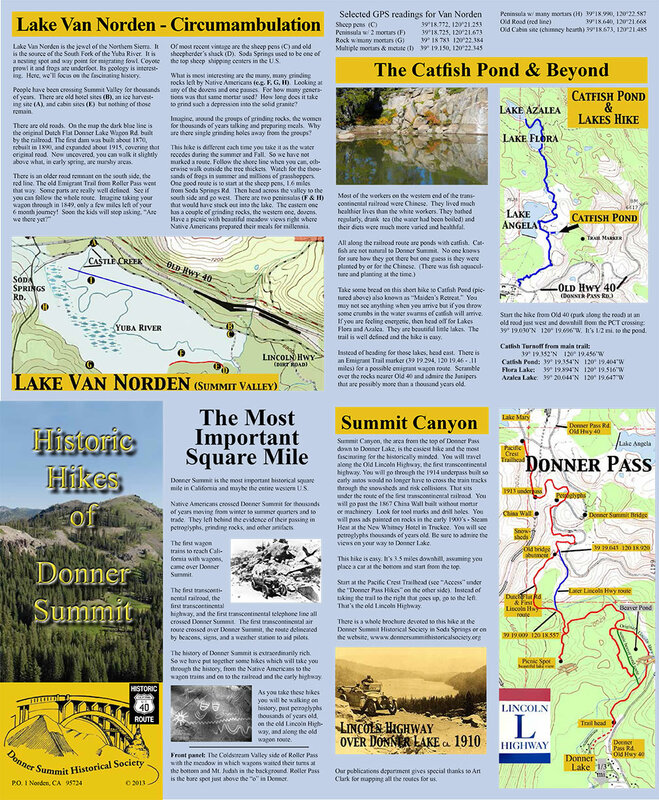 This brochure, "Historic Hikes of Donner Summit" will show you to some really historic spots. The brochure is available in Soda Springs at the Historical Society at the general store in Soda Springs, at the Summit Restaurant, and at the State Park at Donner Lake.. You will not want to try and print it since it's 14X17 inches. You can open it on the screen though and scroll around. the graphics below will link you to the PDF's of the front side and the back side. Then, here is a scrollable version for smart phones. Then we have a separate PDF article, Hiking the Three Donner Passes by eminent emigrant trail historian, Marshall Fey. "A short distance north of the pass I climbed the dizzy heights of a granite peak The view was magnificent. Perennial snow, rock, chasm, forest, lake and stream; a veritable map of the wildest, grandest parts of America, spread out at every side."